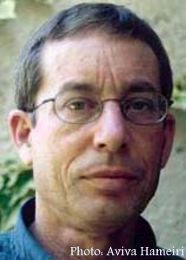 Israel Hameiri was born in Kibbutz Givat Haim (Meuhad), Israel, in 1948 and lives in Moshav Amirim, in the Galilee. He began publishing short stories during his military service. Later, he studied literature and theater at Tel Aviv University and Haifa University, where he received his PhD in theater. A novelist, playwright and critic, Hameiri teaches drama, literature and creative writing at Haifa University and Oranim College. He has published short stories and a number of novels. Hameiri received the Moznayim Prize for one of his short stories (1984) and the Prime Minister's Prize (1985).